2/15 Friday, 79/54, sunny, SE5-10 - With new halyards in hand, after breakfast Dobbs and I headed over to the Columbia 8.7 for a full day of work. The original jib halyard had worn almost clear through the Furlex halyard restrainer, so the first part of running the new jib halyard was for Dobbs to go aloft and remove the restrainer. Then he sent the new halyard over and climbed back up to the masthead. I raised the sail. It originally had a tack pendant, but it situated the clew too high relative to the position of the genoa cars and tracks for upwind work - not enough track extending aft to trim the sail in. Instead, Dobbs installed a Harken halyard restrainer close to the masthead and we spliced a 14” Amsteel pendant to the head of the sail. Chris’ old Harken MkII Unit still works beautifully. While Dobbs was aloft, he also affixed a new spinnaker halyard to the masthead crane. As projects required one or the other of us, we took turns whipping on new spreader boots. 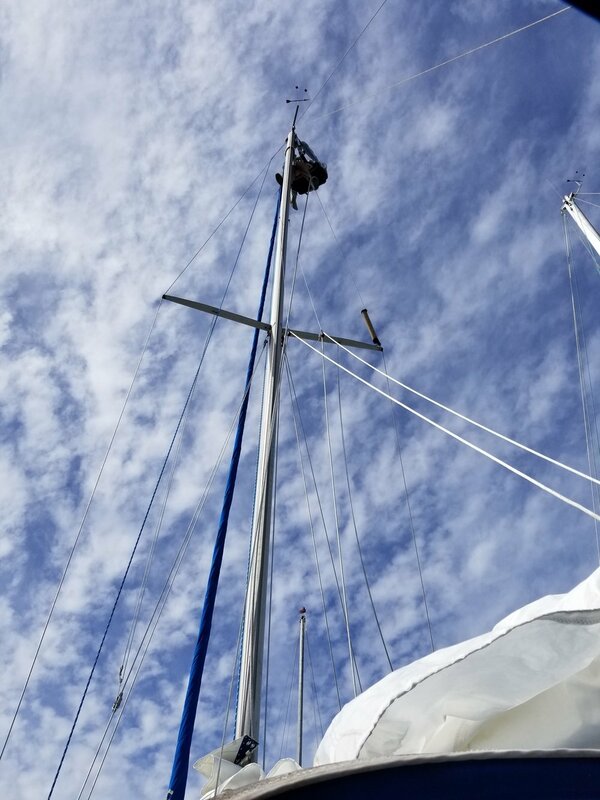 On the boom, I installed an auxiliary cleat for the topping lift and a few fairleads to keep the reefing lines from drooping. Last of all, we removed a mast cleat to make space for a jib halyard winch and added a cleat for the spinnaker halyard. As we were finishing up for the day, Chris (the boat’s owner) came home from work, Steve W stopped by to talk, and my brother Jeff and sister-in-law Michelle arrived in town. Jeff and Michelle live full-time in their motorhome, a Mercedes Sprinter. They were in Jacksonville and found themselves with a free weekend, so they came to visit. There’s a stretch of road just south of the marina parking lot where it’s commonplace to park RV’s - an ideal spot for them to stay. We bid Chris and Steve a good-night and wheeled our tools back to Grace. Jeff and Michelle joined us for happy hour in the cockpit and, later, dinner aboard. I made pulled pork enchiladas, a new recipe for me and adjusted from oven to stovetop. They turned out really good! I was pleased. By 8:30pm, we were all ready to call it a day. Dobbs and I, with Murphy, walked with Jeff and Michelle out to their motorhome and, after taking a tour, bid them good-night. Then Dobbs, Murph, and I returned to Grace to wash dishes and make up the bed. We would have liked to go straight to bed, but showers were in order.